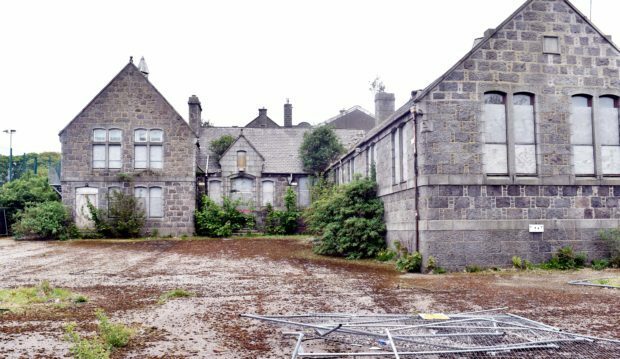 A community group has won a major victory in its battle to take over a historic Aberdeen school. First built in 1878, the granite Victoria Road school in Torry survived a direct hit from a German bomb during the blitz and has been a mainstay in the south of the city for generations. Last night, in a behind-closed-doors meeting of the city growth committee, councillors named the Torry Development Trust and Grampian Housing Association as “preferred bidders” for the site. Since it was closed by the council in 2008, numerous plans have been brought forward to bring it back into educational use, while other private developers have looked to flatten the historic site for houses. Councillors agreed in March to put the site on the market, with the aim of retaining the original granite buildings – a goal that now seems achievable. Neil Clapperton, chief executive of the housing association said: “This approval recognises the importance of restoring and bringing back into use these granite heritage buildings. “We are committed to formal consultations as part of the development process and we look forward to working with the community to progress our proposals for much needed affordable housing along with a nursery and community space to regenerate the area for the people to Torry. “We will be able to lever considerable Scottish Government funding, estimated to be £5 million, while the project is part of Grampian Housing Association’s capital programme that looks to build 400 new homes by 2021. David Fryer of the trust said: “Our project reflects the desire and ambitions of the community of Torry and many folk far and wide who wanted to see these fine granite buildings continue to meet local needs. Torry and Ferryhill councillor Catriona Mackenzie said the committee’s decision marked “a turning point” for the future of the old Victoria Road School. “For the first time in years we can look at that site and know a positive and progressive future is on the cards,” she said. Aberdeen South MP Ross Thomson added: “This project will deliver some much-needed social housing for Torry, while retaining these historic granite buildings.